A majority of higher education institutions in 33 European countries say that increasing international revenue is not the main rationale behind their internationalisation initiatives. Instead, it is to improve the overall quality of education they are able to provide students. This is one of the major findings of a new study from the European Association of International Education (EAIE): The EAIE Barometer: Internationalisation in Europe. “The definition of internationalisation has evolved since the 1980s, when the focus was on social and political rationales. In the late 1980s, internationalisation was commonly defined at the institutional level and in terms of a set of activities,” says an extended Executive Summary of the report released by EAIE. 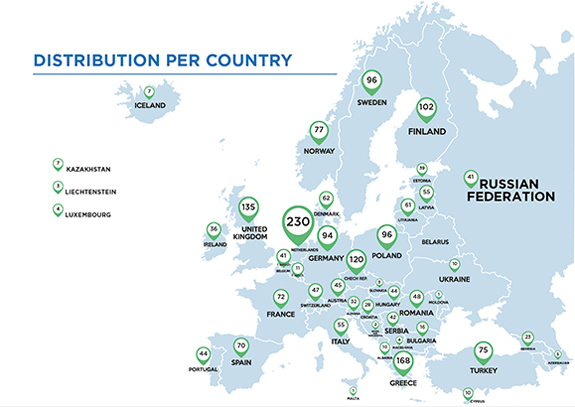 The EAIE Barometer examines the state of internationalisation in the European Higher Education Area (EHEA) based on a survey of 2,411 education professionals working at approximately 1,500 higher education institutions from 33 countries in the EHEA. The first edition of what EAIE expects will be a recurring study, the current survey was conducted in spring 2014 and complemented by responses from 318 professionals “working in the field beyond higher education institutions” (i.e., in developing or implementing policy, for example at national ministries of education, national accreditation bodies, national higher education agencies, consultancies specialised in higher education, and others). An interesting element of the survey report is that it classifies institutions in terms of their internationalisation profiles: “leading, average, and lagging.” This segmentation allows for an analysis of what staff at institutions just beginning their internationalisation efforts – or encountering issues in their implementation – might need to achieve more success. Most respondents to the EAIE survey cited non-monetary reasons for the internationalisation of their campuses: 56% said the main rationale was to “improve the quality of education” and 45% said it was to “prepare students for a global world.” Attracting international students and improving the reputation of an institution were also cited by many respondents (37% and 35%, respectively), as was improving the quality of research and development. Least important according to educators was “financial benefits for the institution” (10%). EAIE highlights that leading institutions also prioritised international research and innovation in their institutional strategies relative to other institutions. The report notes this emphasis is generally indicative of institutions committed to improving quality as well as linked to such institutions’ greater focus on maintaining or elevating their reputation or their position in international rankings. Implementation of the internationalisation strategy of the institution (35%). The following graphic depicts the top challenge practitioners identified in various countries. An increase in the number of courses and programmes with an international component and taught in English. Respondents pointed to both gains in, and challenges with, establishing strategic partnerships. More than half (55%) have noticed an increase in the number of strategic partnerships their institution is implementing (20% “substantial”), and 40% also said that strategic partnerships are an area of significant challenge for them. The most influential factor respondents cited as driving their institutions’ internationalisation efforts was internal institutional priorities (54% “strong influence”), with national level policy (41%) and EU-level policies (38%) next. Information on external funding programmes. Interesting to all institutions – whether included in the survey, in Europe, or elsewhere – will be the EAIE Barometer’s findings on what leading institutions are doing differently in their internationalisation strategies. It seems that establishing a distinct area of focus within an institution to internationalisation – complete with its own expertise, goals, and budget – is part of a winning formula for many of the leading institutions. This entry was posted in Europe, Higher Education, Regions, Research and tagged European Union student recruitment, higher education statistics, undergraduate student recruitment, universities with international students, education abroad.